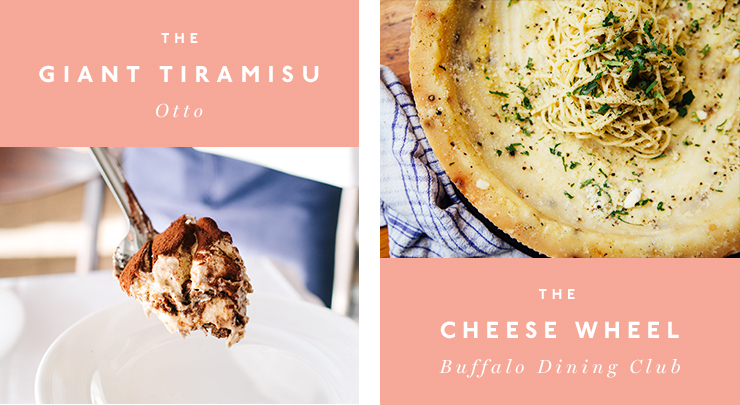 It's no secret that here at The Urban List, we love our food—literally all food. That’s why we’ve taken it upon ourselves to scour the entire city and find alllll of the dishes that you must have eaten if you live in Sydney. It’s a tough job, but someone’s gotta do it. Oh how we love our jobs, and food. Did we mention that we love food? Keep reading to find out everything you should have eaten in Sydney. 1. The all-star burger at Bangbang Cafe (must add maple bacon). 2. The cheezus fried chicken sandwich at Butter. In fact, any fried chicken sandwich at Butter. 3. Black sausage sanga at Ester. 4. 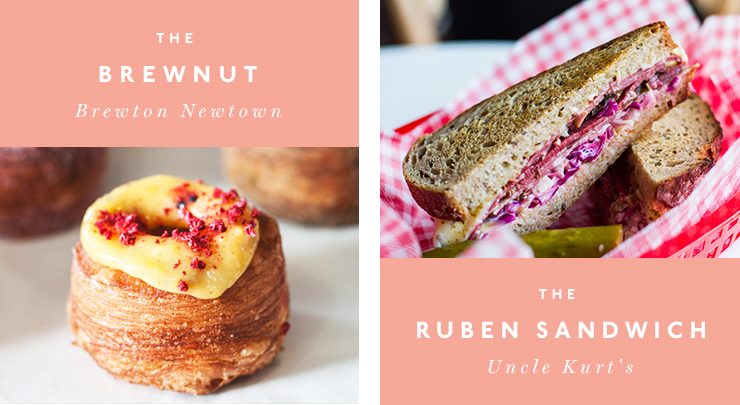 Smoking Gun Bagels for literally anything involving a bagel (grab a cheeky coffee while you’re there though). 6. Cookie dough scoop from Joe Dough (in fact, three). 7. Pumpkin ravioli doused in burnt butter from Casoni. 8. 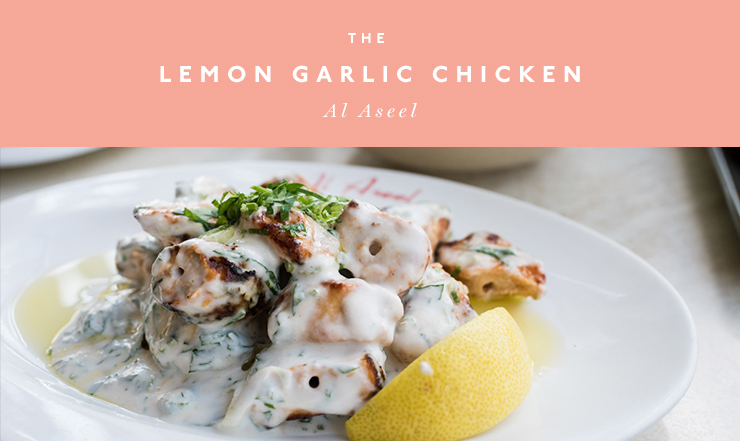 The lemon garlic chicken from Al Aseel is everything you’re picturing. 9. Pork and fennel sausage roll from Bourke Street Bakery followed up with their killer meat pie. 10. Cheeseburger spring rolls from Ms G’s (#enoughsaid). 11. Kick off your day with a pulled pork shoulder narnie from Three Williams. 12. Strawberry and watermelon cake from Black Star Pastry. 13. Order anything from A Tavola (but particularly the cherry tomato fusilli). 14. Pretty as a picture vanilla slice from Drury Lane. 15. Crispy pork nacho fries (at 2am ideally) at Mr Crackles. 16. Toko's tuna tartare with truffle, yuzu & lotus root. 17. Then head downstairs for a brewnut from Brewtown Newtown. 18. A big ol’ ruben from Uncle Kurt's. 19. Any croissant from Textbook. 20. A dozen Pacific Bay oysters from Watsons Bay Boutique Hotel. 21. Ricotta cannoli from Pasticceria Papa is authentic and way too delish. 22. Oozy saganaki from Apollo will literally make everything better. 23. Pop a few popcorn shrimp at Saké. 24. The OTT blame Canada burger from Bar Luca will make fatty Friday 1,000x better. 25. Keep it classic with a chicken tikka from Ginger Indian in Parramatta. 26. A slice from the giant tiramisu at OTTO. 27. Pasta from the wheel of cheese at Buffalo Dining Club (and Chester White). 28. The guac at Mejico is a top 3 and smashed right at your table. 29. Jersey milk haloumi from Nomad is a classic. 30. Chicken Schnitzel sandwich with the lot at South Dowling Sandwiches. 31. Trippin’ Zeahorse from BondiTony with extra Miss Piggy. 32. Deep dish Chicago pizza from Johnny Fontane’s (then a nap). 33. Warm up with a Sunday roast and glass of red at Riverview Hotel. 34. Grab a mate and order the ploughmans from Cornersmith. 35. 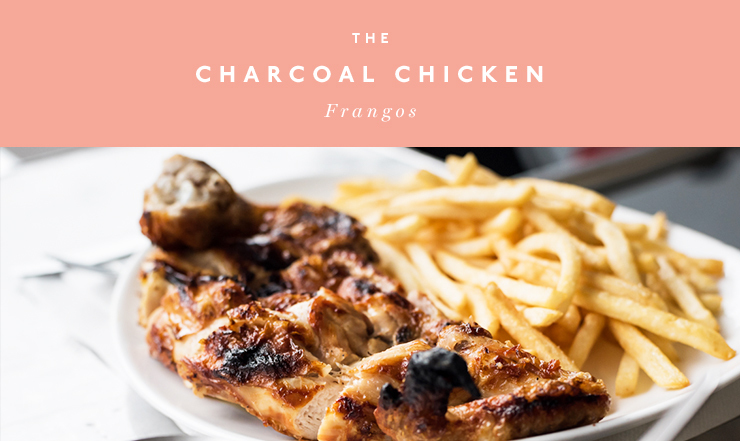 Sydney’s best Portuguese charcoal chicken is happening at Frangos (their burgers are also ridic—add chilli mayo). 36. Hopper with soft fried egg from INDU. 37. Bacon Mac Daddy from Cuckoo Callay is almost too much to handle (but not quite). 38. Mary’s Burger—if you haven’t had this one yet, then do you even Sydney? 39. Ditto with the ricotta hotcakes from Bills. 40. Authentic pork banh mi from Marrickville Pork Roll. 41. Cookies as big as your head from Bread & Circus. 42. While we’re at it, the Lebanese charcoal chicken with garlic sauce from El Jannah is mandatory. 43. 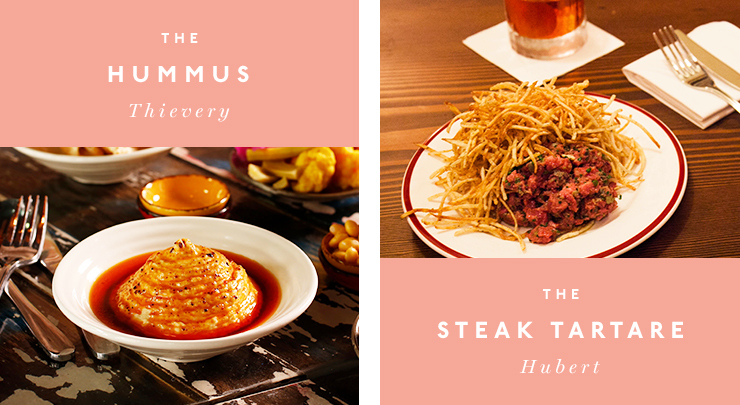 Thievery’s burnt butter hummus is everything. 44. Prime beef tartare with fries (and a margarita on the side) from Hubert. 45. Tempura anything and everything from Toko. 46. Smoked beef brisket with a soft little egg at Brick Lane. 47. The classic O.G cheeser from Burger Head in Penrith. 48. Eat your weight in mussels at Moretti and thank us later. 49. Dumplings, dumplings and more dumplings from New Shanghai. 50. Cheesy dessert and a dance with the bearded bakers at Knafeh. Put a fork in us Sydney, we’re done! Bon Appetit! Prefer booze? These are our fave new bars.